1. 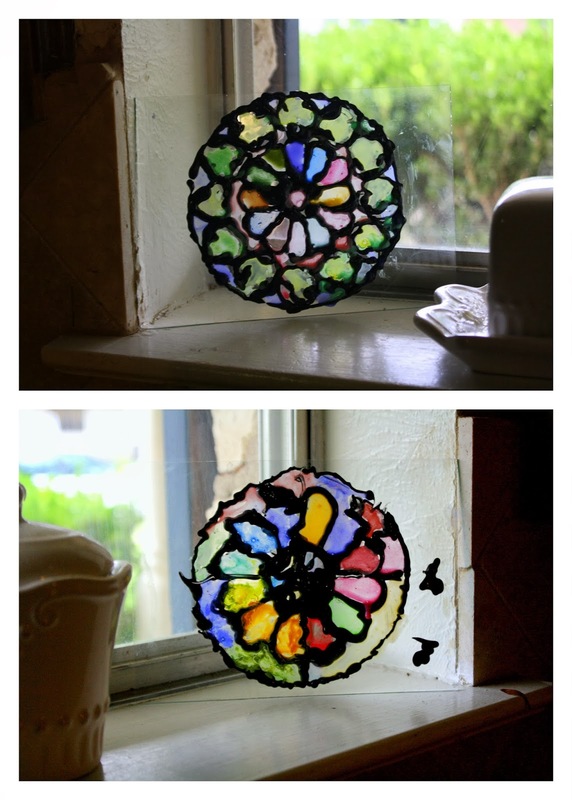 Find a simple outline of a rose window online (a google image search produces lots of options), resize it to fit your glass rectangle, and print onto paper. 2. Place the paper with the outline underneath the glass rectangle. Trace the outline of the rose window onto the glass using the black puffy paint. There will probably be more detail on the outline than is possible to include in the tracing. I let my six year old decide which lines to trace and which to ignore. If you do a little research you can easily find the technical terms to describe the different kinds of shapes in your particular rose window. For example, my six year old's window included a central roundel, and trefoils around the outside of the wheel. It's ok if your child doesn't have a perfectly steady hand with the tracing or if the lines run together at some places. The black puffy paint looks like lead between the panes of glass, and wobbly-ness is actually a pleasing effect here. Also, you can touch up major mistakes with a paper towel. 3. 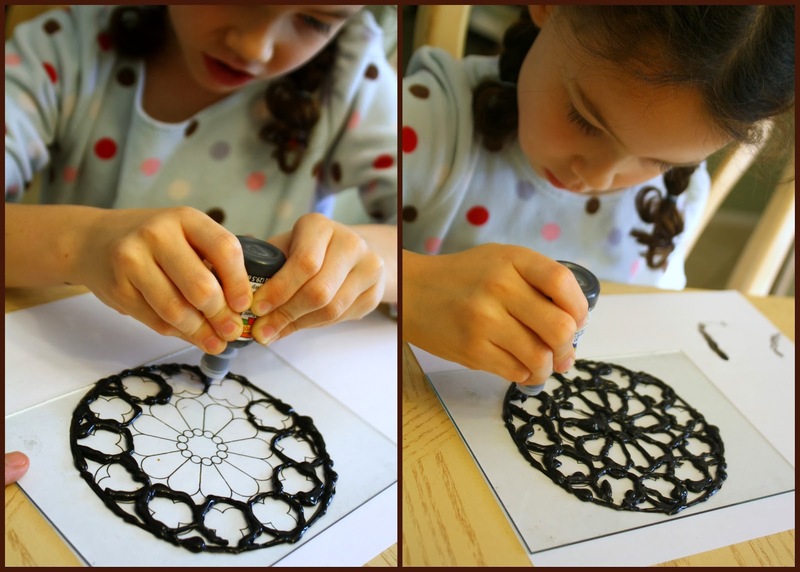 Allow the puffy paint outline to dry. (At least three hours). 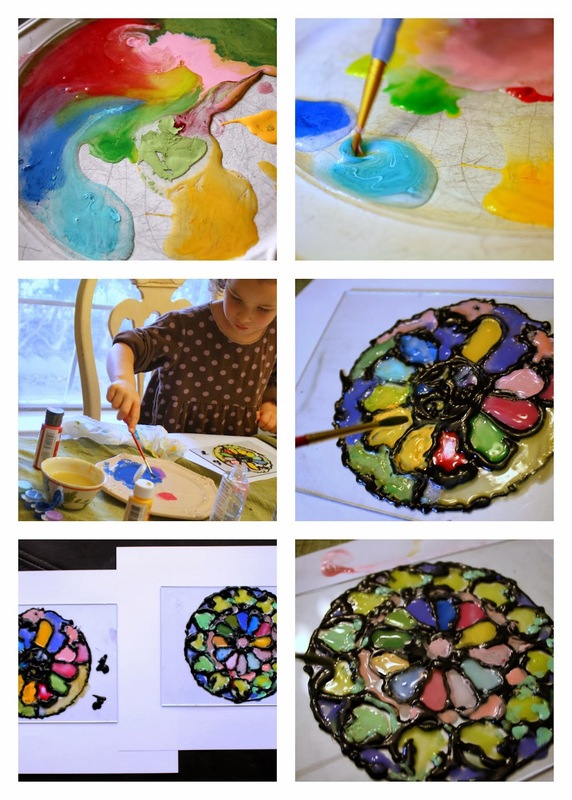 Mix acrylic paints with clear gel glue on a palette. There is no exact ratio to follow. The finished color on the glass will be more or less opaque depending on the amount of glue. Different amounts of transparency in the same window can be pleasing. Just make sure the glue is thoroughly mixed with the glue before painting with it. If you paint with a little bit of paint that has no glue mixed in, the finished product will have brush marks instead of the smooth look of stained glass. Make sure all the panes in the window are thoroughly filled with paint for best results. Allow to dry overnight. They are a gentle reminder to me to stay in fellowship with Christ during the day! Do you think this would work on Acrylic "Glass"? I have some from some old IKEA picture frames that ended up in the trash and for some reason I saved the plastic out of them. My two boys would love doing something like this. Yes, I think it would work just fine with acrylic. Can't think why not! Good luck!